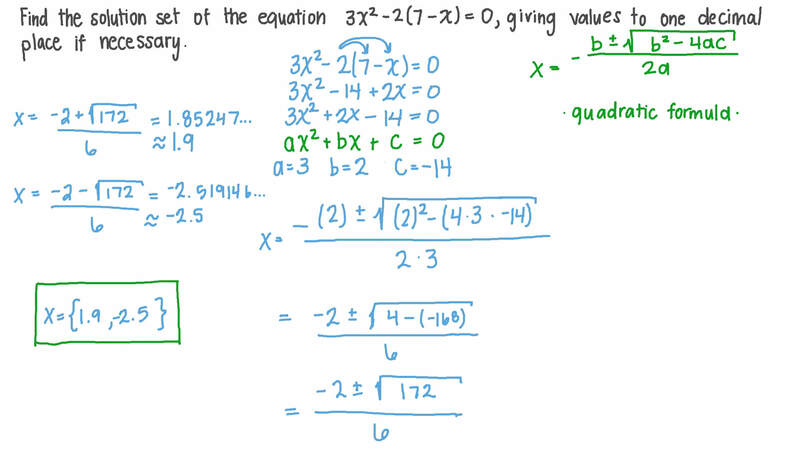 In this lesson, we will learn how to solve quadratic equations using the quadratic formula. Solve the equation − 𝑥 + 7 𝑥 + 1 = 0 2 . Find the solution set of the equation 3 𝑥 − 2 ( 7 − 𝑥 ) = 0 2 , giving values to one decimal place. Find the solution set of the equation 𝑥 − 8 𝑥 − 2 = 9 𝑥 + 8 2 , giving values correct to three decimal places. Find the solution set of the equation 5 𝑥 − 7 𝑥 − 3 2 = 0 2 , giving values to three decimal places. Find the solution set of the equation 1 8 𝑥 + 5 𝑥 = 1 2 , giving values to three decimal places. Find the solution set of 1 6 𝑧 = 3 2 𝑧 − 1 5 2 in ℝ . Find the solution set of the equation 5 𝑥 ( 𝑥 − 6 ) − 3 ( 𝑥 + 4 ) + 3 = 0 , giving values to one decimal place. Find the solution set of the equation 2 𝑥 − 5 = 6 𝑥 , giving values to three decimal places. Given that 𝑥 = − 1 is one of the roots of the equation − 3 𝑥 − 9 𝑥 + 𝑘 = 0 2 , find the other root and the value of 𝑘 . Find the solution set of the equation ( 𝑥 − 5 ) − ( 𝑥 − 5 ) − 3 = 0 2 , giving values to one decimal place. The sum of the roots of the equation 4 𝑥 + 𝑘 𝑥 − 4 = 0 2 is − 1 . Find the value of 𝑘 and the solution set of the equation. Given that is a root of the equation , find the set of possible values of ? Find the solution set of the equation 3 𝑥 + 3 − 4 𝑥 − 3 = 3 in ℝ , giving values to one decimal place. The dimensions of a rectangle are 5 m and 12 m. When both dimensions are increased by a given amount, the area of the rectangle will double. What is the amount? Find the solution set of the equation in , giving values to one decimal place if necessary. If 𝐿 and 𝑀 are the roots of the equation 𝑥 + 2 4 𝑥 − 6 = 0 2 , what is the value of 𝐿 + 2 4 𝐿 − 1 7 2 ? Find the solution set of 𝑥 + 1 7 𝑥 = 6 in ℝ , giving values to one decimal place. By using the quadratic formula, solve the equation 2 𝑥 + 3 𝑥 = 7 2 . Give your answers correct to two decimal places. Use the quadratic formula to find all the values of 𝑎 for which the roots of the equation 2 𝑥 + 𝑎 𝑥 − 7 = 0 2 differ by exactly 10. Give your answers correct to two decimal places if necessary. Find the solution set of the equation ( 𝑥 − 2 3 ) − 6 𝑥 = 0 2 , giving values to three decimal places. Find the solution set in ℝ of the equation 4 𝑥 − 2 𝑥 = 1 , giving values to one decimal place. 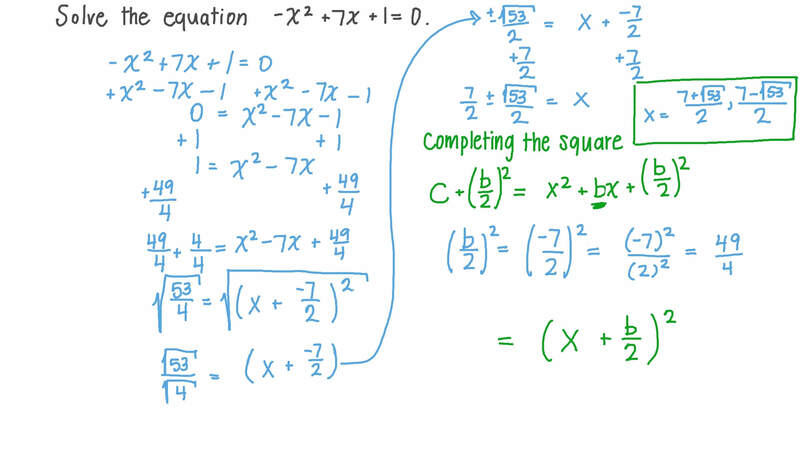 Using the quadratic formula, find all the solutions to 𝑥 − 1 0 𝑥 + 1 = 0 4 2 . 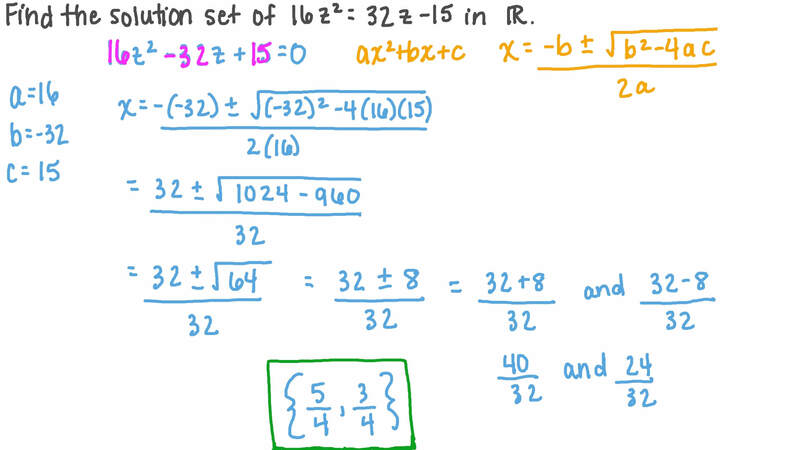 Find the solution set of the equation 𝑥 + 4 6 𝑥 = 2 2 , giving values to three decimal places. Find the solution set of 𝑥 − 6 ( 𝑥 − 1 ) = 2 2 in ℝ , giving values to two decimal places. Find the solution set of the equation , giving values to three decimal places if necessary.